”Watching the world through the eyes of a child in Elysium… will I know you then?” What could be better start for the weekend, other than a Kamelot concert at friday night? Maybe nothing! Kamelot announced a new album called Haven in May of this year, again with producer Sascha Paeth and the album landed in Finnish charts at #12. This album also reached their highest position ever in Finland and also in a few other countries, like Japan, Austria, Canada etc. The album is packed full of metal, which contains also a few guest musicians, for example Alissa White-Gluz, Troy Donockley and Charlotte Wessels. Actually I haven’t read any reviews for this album and I have only listenend to it myself and honestly liked it all very much and I still wonder why they only play about two, or three songs from this album? Well, that’s all I have to say about the album. Let’s check out how I felt about Kamelot’s gig in Seinäjoki, Rytmikorjaamo 2.10.2015. First of all there were two support bands with Kamelot in this tour. They were Kobra And The Lotus and Gus G. I listened to Kobra band about two days before the show. Normally I don’t like when headlining bands carry support acts on tour, because I’m fine with the main act always, but I decided to check out all three bands now. 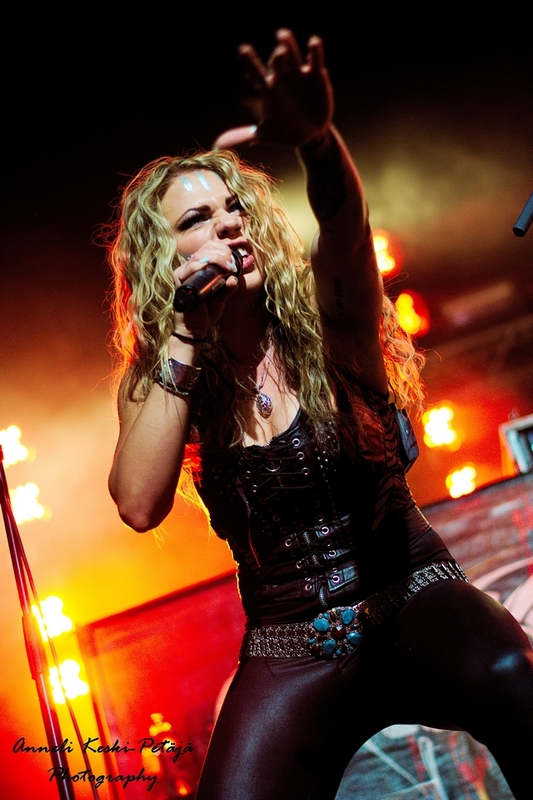 Kobra And The Lotus started their set with the song Soldier, which was the only song I knew that night from Kobra. They maybe had a good punch of catchy heavy metal songs, but nothing more to me. Maybe another night it would work better for me, but this night was Kamelot’s. 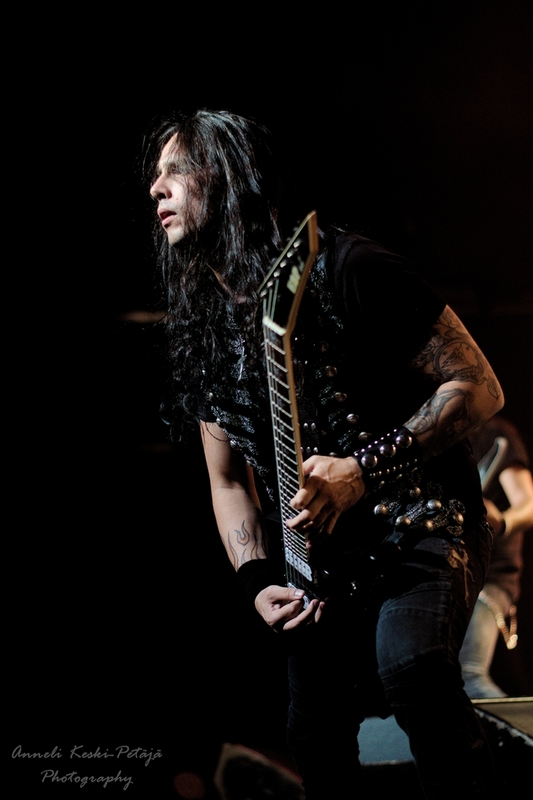 Another support act was Gus G. The Greek guitar player, who is known from Firewind and Ozzy Osbourne’s band. I’ve never heard one single track by this man’s solo project, so the highlights for me was when they played a couple of songs from Firewind era. Sorry if you are a huge Kobra, or Gus G fan and read this report: I have nothing more to say. When the Haven European tour was launched, there were four shows in Finland. Seinäjoki is the nearest point from me, so that was the oblivious choice for me. I’m not a huge Kamelot fan, so I think I will not be ready to travel a lot to catch this band. Nevertheless this was my third time at a Kamelot show and maybe the best one yet! But the setlist should’ve been a little bit longer. Kamelot did a USA tour before the European part and then the setlist was little bit different. And in my opinion the list was better in the European leg. Lucky me, heh… For example the European tour list was started with Veil Of Elysium, which I think is one of the more catchy songs from Haven: listen to that cool chorus and I’m sure it will take you with it! This one definitely shows you what it’s all about in Kamelot and what they do best. Fast catchy songs with very powerful choruses. Maybe that was a little bit of a sad thing too, that they putt this particular song as starter song: I wasn’t able to take photos, because my singing, ha! The set continued with another fast one, called When The Lights Are Down. Singer Tommy Karevik showed his cool stage style and emotions and I’m sure I’m not the only one, who still thinks that this man is like a Roy Khan #2. I think I’ve never seen another band, where the singer’s replacement was so one-to-one, as Karevik and Khan. But anyway it’s cool and he fits very great into Kamelot. I can only guess, that Kamelot has also reached their highest chart positions with Tommy Karevik with their last two albums. The Great Pandemonium, Center Of The Universe, Karma, Torn etc. the setlist was full of great songs. And the biggest highlights for me was definitely the new songs from Haven, which were Veil Of Elysium, Insomnia and Revolution, even though the last one could have been replaced with another one, like Beautiful Apocalypse. I hope they put this song into the setlist someday. Another highlight by me at the evening was again to see how impassioned and alive the bass player Sean Tibbets is on the stage. I play bass guitar at home a little bit too, so bassists are always the first ones I notice everywhere. 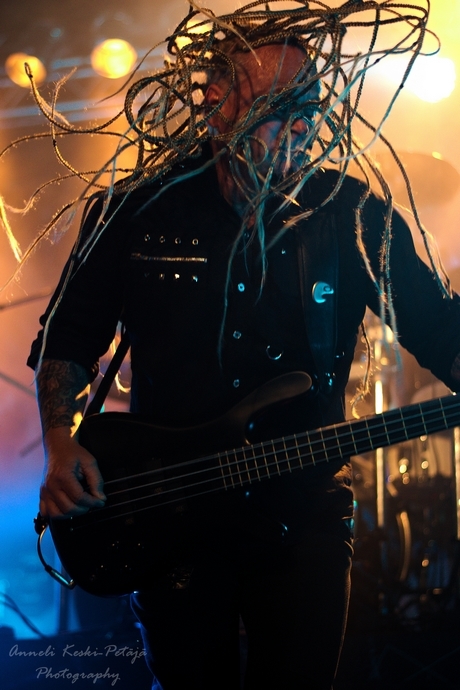 And Sean does it definitely with style with his Warwick bass and long dreadlocks. Kamelot have been recording and touring with female singers also. 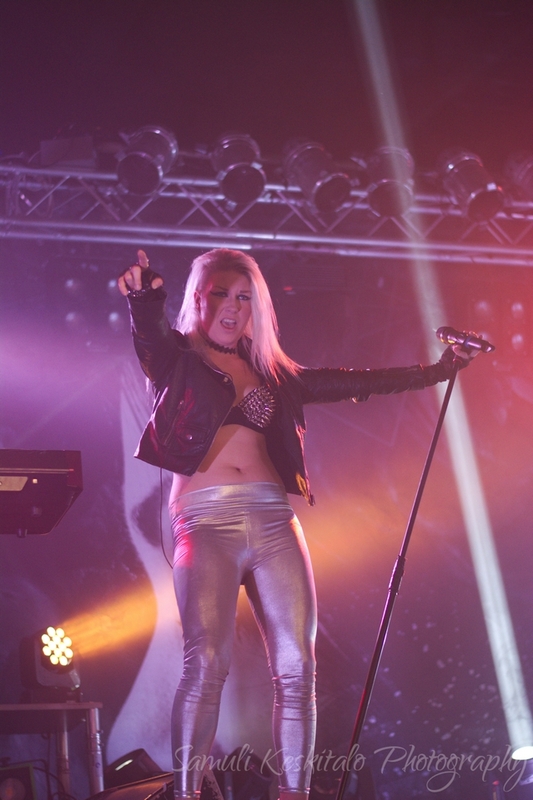 There have been several female singers on tour and this time the female parts were taken by Linnea Wikström. Many might have noticed her from her career in Therion, where she sings as a live musician. For me female singers have never been the biggest thing for Kamelot, but a I have nothing bad to say about how she sang this night or took her part of the stage. I’m happy, if she stays in the band for a long time. I mentioned a few paragraphs ago about the setlist, which was good, but of course there’s always something minus so say about it. 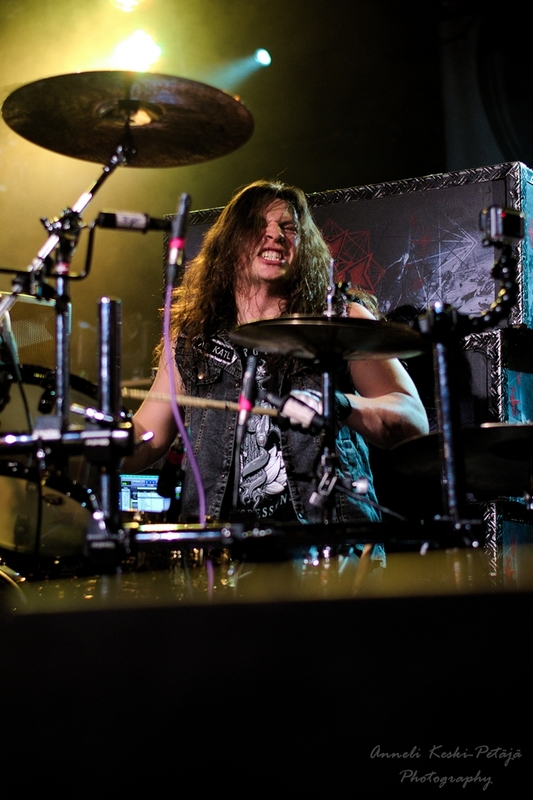 Drummer Casey Grillo played a drum solo, which I can only say…why? I would say it was boring. I like how Grillo plays his kit and definitely his coolest thing is to twist his drumsticks, but the own solo this time was a little bit of a joke. I’m not a huge solo fan (guitars, basses, drums) anyway and I always recommend to put in some real song instead of doing your own solos. Don’t worry Mr. Grillo, if you read this, you still got a nice little place in my heart as a Kamelot drummer, hah! Before the encore Kamelot played a couple of songs, which were in the right time at the right place. They were Liar Liar (Wasteland Monarchy) and Forever. In my last report I wrote something about, when bands always play the same song at the end of the show, or at the encore or something like that, but maybe now I have to take that part back, because of the Forever song. Some songs make so many good memories and this one is one of those tracks to me. 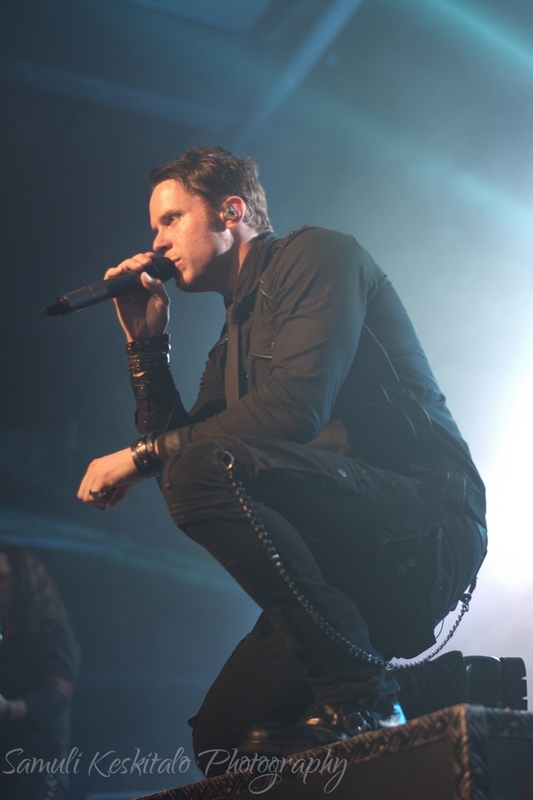 During this song Kamelot introduced the band to the crowd and made a little singalong also. Too long of course… hah. But maybe it was fine this time. The encore contained two songs. Revolution and Sacrimony (Angel Of Afterlife) containing an Manus Dei intro tape. This song is definitely the biggest hit of the Karevik era and for me it’s also one of the best songs from Kamelot. Even though I still don’t get the idea of the music video – could someone please explain it to me? Haven European tour still continues in countries like Poland, France and Italy. Even if you’re not a big Kamelot fan I still recommend for going to see them. The world’s coolest ”photoshop band” is on stage as it’s best.